The Compact HRE SB boiler has been designed and manufactured by Intergas. 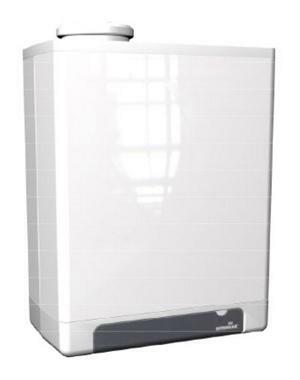 It is a condensing and wall mounted system boiler. As a system boiler it will heat water for both your central heating system and to be stored in hot water cylinder for domestic use. The key parts of the heating system such as the pump and expansion vessel are built within a system boiler, making it quicker and cleaner to install. This also means you get a faster response to demand for heating and hot water and you don't need to have a feed and expansion tank in the loft. This boiler is a highly reliable unit which has a SEDBUK rating of A as it operates at 89.2% energy. This particular model has an output rating of 27kW making the unit perfect for a medium sized property which does not have a high hot water or heating demand. This boiler is able to work with either a standard on/off thermostat or a programmable room thermostat. It also comes includes a built in frost thermostat which helps to protect the boiler through those cold winter months when the unit is needed most. This unit has no air pressure switch, almost no standby losses and the choice between a horizontal and vertical flue option. You can rest assured that your boiler is of the highest quality as it includes a 10 year warranty on the heat exchanger and a 7-year warranty on parts subject to return of the warranty card.